Fortress Of Freedom Board :: View topic - Landmark Trees Removed: Part 3! Landmark Trees Removed: Part 3! Posted: Sun Feb 18, 2007 10:13 am Post subject: Landmark Trees Removed: Part 3! I had to paste two photos to get all this in - This is one massive Walmart Store! This is probably our final installment from Dave Getchell's original report about the midnight destruction of old trees that stood as landmarks at the old Knob Hills Food Terminal head office. The head office was also home to rare and valuable antiques and art, the building itself possibly being of historical value. 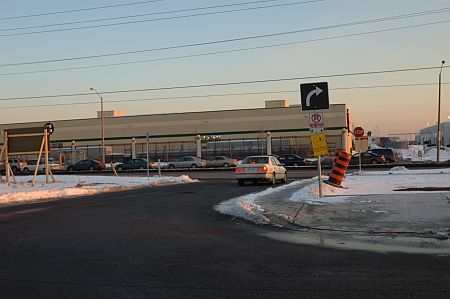 Nevertheless, the building and those glorious trees were torn down to make way for what we now see as one of the largest intimidating Walmart stores in Canada! Check out that photo above, I could not even get the whole of the store in my camera - yes that is one store! 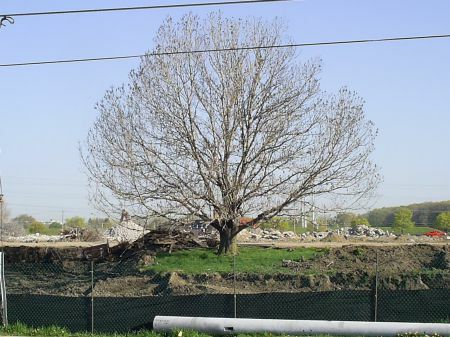 Outrage: "Landmark" Trees Removed From Neighborhood! I tend to travel to work each day along the same route, and pass the site where the �Knob Hill food Terminal� at Eglinton and Pharmacy/Warden used to be, each day, the string of trees that lined the roadside was a welcome sight, and some years after the buildings in the background were reduced to rubble, the trees stood next to the avenue in their glory. These trees left, to me, a strong image of either survival or impending doom depending on the how positive one�s point of view was and I would have like to have taken these photos in winter with the background rubble piles providing further contrast. Sometime this week these trees were taken from the landscape, islands of beauty in an ever-crowding-oxygen-starved city were excised to make way for a new place to shop. The business that takes up residence on that space need not try to defend its action, I will not support them! With the above evidence, Dave's fears may have been correct. This story will require more investigation as to what happened to the trees. There is an ambiguity in the city notice that does not answer to question of final disposition. So even though I have passed on much of the reporting/newspaper duties to Mark Herbert; I will don my reporter's cap and see what actually did happen to those trees. 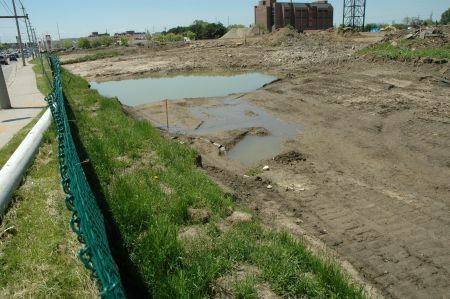 The City Of Toronto gave their "blessing" to the developers to do this and so we will hold the city responsible for any actions that fall outside of the spirit of the by-law that was put into place to protect large trees. Perhaps the trees have been relocated and not destroyed, but that still does not answer why they had to be removed. Dave is a resident of this area, and I take his concerns as to the future vision of his neighborhood seriously. I am by no means a "tree hugger" - but there is enough here to even make me question the "whys" of the city in this matter. Dave's fears about the ultimate fate of the trees seems to be correct. In discussion with City Of Toronto employees at the office building at 18 Dyas Road here in Toronto; it was revealed to me that the trees of the size found at that site in question, had to have been destroyed as the root structure is several times that of the tree structure above ground. 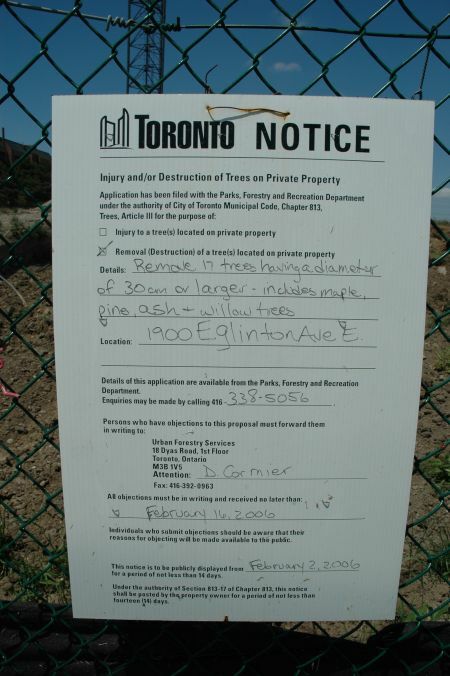 The petition to remove/destroy the trees was processed and a date for objections was granted, the developers were given the go ahead and a payment of 588.00 dollars was forwarded to the City Of Toronto for every tree removed. 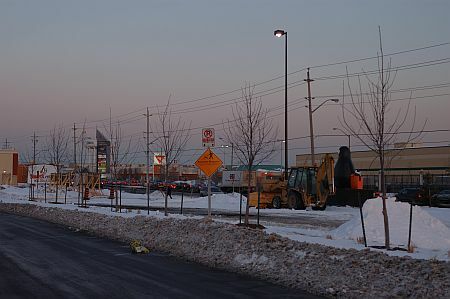 Seventeen trees were removed. where most of the old trees resided. 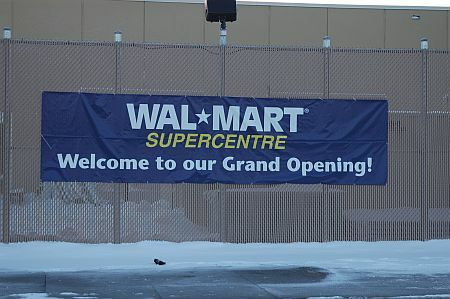 So the place to shop turned out to be Walmart, one of the largest retail corporations in the world boasting profits of 10 Billion a year (10.27 Billion in 2004). 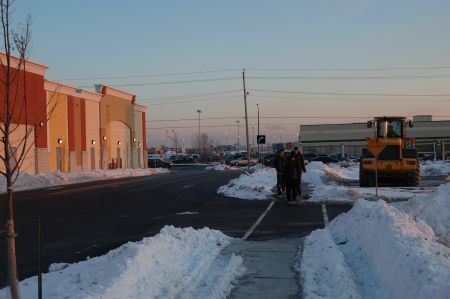 We all know the failure of Walmart to be good corporate citizens to the communities they inhabit. I now see how invasive this corporate mentality goes, even to such small, yet important, things like the landscape of the neighborhood. What a waste, these saplings replaced the older tress almost to the tree in the exact locations! Look at that photo above. That was where those trees used to be lined up. There are now a similar number of saplings lined up in the same way in the same location - Tell me those original trees could not have been left alone..... There are only two points of ingress and egress to the street where the old tress resided and they are off to the east side of the site. I say again that the destruction of those trees did not have to happen, there are no structures that would have required it! The second entrance/exit about 150 feet from the other one. Attempts to contact Walmart resulted in the usual runaround to nowhere. What did you expect? So it appears that Dave Getchell's worst fears have come true. I am by no means a tree hugger; but my eyes have been opened into what some have feared as big business run rampant. FOF is also a corporation, but I for one would never want to see it become the indifferent big bully that these large multi-nationals have become.